Drivers, check your tread depths! Many drivers are aware that a tyre’s tread depth will significantly affect driving safety. Nevertheless, few drivers bother to check the condition of their tyres mid-season. This would be a good idea, however. New winter tyres have a tread depth of 8, and sometimes even over 9, millimetres. The law in many countries forbids using winter tyres with a tread depth below 3 millimetres. For safety reasons, however, the minimum recommended tread depth is 4 millimetres. Using worn tyres will extend the car’s braking distance and make it more difficult to handle, especially under slippery conditions. Moreover, the tyres are not able to clear the snow and slush from underneath them, and that causes the feel for the road to disappear. – Unfortunately, drivers are lazy. People check tread depths when fitting the tyres, but then blissfully forget about them for the entire winter, says Matti Morri, Technical Customer Service Manager for Nokian Tyres. Tyres wear down unevenly. In a front wheel drive vehicle, the front tyres wear down much quicker. For this reason, you should monitor the tread depth throughout the winter and rotate the tyres from front to back. – This ensures that you have the same amount of grip on the front and rear axles. A suitable rotation interval is 8,000 kilometres, Morri explains. If the winter tyres are fitted early in the autumn and they are used heavily until the end of the spring without rotating them from one axle to another, it is completely possible that the front tyres will have worn down while the rear tyres may have up to 7 millimetres of tread. – The difference between tread depth on the front and rear axles should not be more than two millimetres, Morri reminds us. In addition to the grooves, the studs will also wear down more evenly when tyres are rotated. 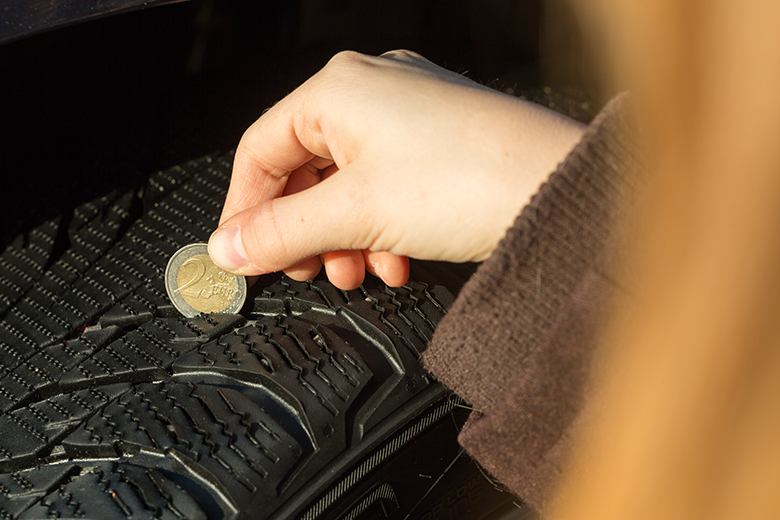 A two-euro coin is a handy tool for measuring the main grooves in the centre of the tread. If the silver edge of the coin remains visible from the groove, less than 4 mm of tread is remaining. A match can also be used to measure the tread depth. A regular match is less than 5 centimetres long and has 3–4 millimetres of sulphur at the end. All of the newer tyre models from Nokian Tyres have a Driving Safety Indicator (DSI) fitted as standard. It is a series of numbers (8–6–4) on the tread that indicates how many millimetres of tread are remaining. In other words, when the number 8 disappears, the tread depth is less than 8 mm. When the number 6 disappears, you are approaching 4 millimetres and need to consider replacing your tyres. There is also a snowflake symbol next to the 4 mm mark. Once that disappears, the tyre has worn down too far and it is no longer safe for winter weather.